When I saw that this Ventures record was being reissued I thought "I'd never seen that one". 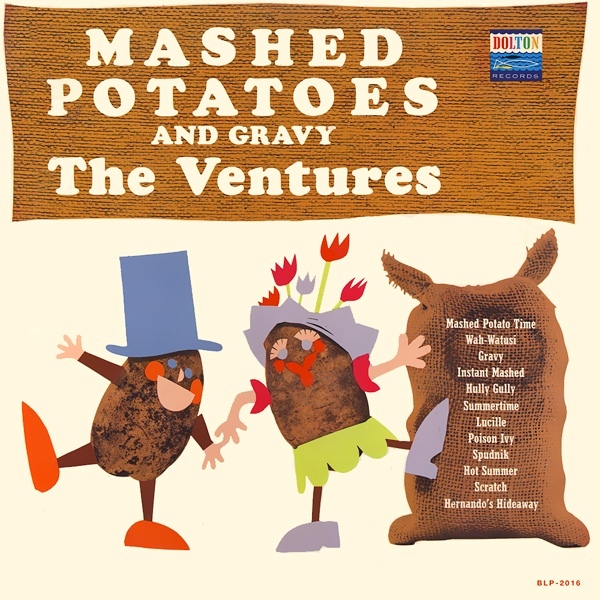 That's because it's an alternate edition of the "Mashed Potatoes and Gravy" record they put out. Tsunamish have been on a steady one-EP-a-year release schedule so far, and this should please if you've been a fan of them this far. For the most part it's upbeat modern-traditional surf rock, though there's a bit more of a punk sound on their Bad Religion cover of "We're Only Gonna Die" and they have vocals on their cover of Holly Golightly's "There is an End". While I think it has gotten better in the 2010s, I think it's understated how often poor sound engineering has held back an otherwise decent surf record. What we have here is the opposite story. Genki Genki Panic's previous releases weren't hampered by their production, but "Spooky Fingers" makes an amazing impression in an instant, setting a brand new idea of what this band is about. This is the debut EP from Seattle's Delstroyers. The play kick-em-in-the-teeth surf with a little bit of a horror edge to it. The winner of the 4-pack is "Take me to the Hell-Hop" with a some great guitar interplay, and moments of the guitars really cutting loose then cutting back. It's all good, fun, stuff that I could imagine being pretty fun live. All four tracks are available for free download on their Reverbnation page. Looking foward to hearing what's next from them. Though the Phantom Operators never keep you waiting long for more material, this is the second full-length from the Tennessee-based group. When listening to them, there's one word that comes to mind: desolate. The guitars go on and on, but with a bit of a melancholy and not so much of that California brightness. It fits the desert theme that runs thoughout much of the Phantom Operators' material. Here are 11 originals from Italy's Surfoniani. They've got upright bass, some very drippy guitar and drums, which gel into a bright and sunny modern trad sound. They've got a fair amount of beach party shakers like "Bikini", "Mai Tai Girl", and "Tiki Twist" though also a few cooler ones like "Red Waves". Give it a listen! I don't know too much about Kozyol - despite being based in Portaldn, I'm guessing at least one of their members is Russian, which would explain why some of these songs are in what I assume to be Russian. Definitely pretty funny for me, writing this on a trip to the nation of Georgia and having just gotten back from the Stalin museum. That really doesn't have anything to do with anything.